There are people who eat to live, and there are those who live to eat. While the former have little or no interest in what they eat, the latter prefer to know the little details, savor each flavor, absorb every aroma, and feel each texture when they treat their taste buds to delicious gastronomic delights. One may say that as long as the food tastes great, there is little or no need to deliberate much over what is in it, or where it came from. The motive should be to enjoy what’s on the plate and let it linger in your senses. However, a real food enthusiast would love nothing more than to do just that, plus know more about the origins of the food that has brought him so much joy, the factors that have influenced it over the years, the ingredients used to make it taste so divine, and the unique quality which sets it apart from the rest. This brings us to Greek cuisine. It is often confused with Arabic cuisine, thanks to the stark similarities in the process of cooking food resulting from the Ottoman regime. There are, however, certain subtle yet important differences between the two cuisines which help distinguish between them. Let’s have a look at some of the characteristics of both cuisines to understand them better. We love using a variety of ingredients in our food, most of which are high in nutritive value. We incorporate a lot of fresh vegetables, legumes, cereals, fish and seafood in our cuisine, which makes it very balanced. These ingredients are also the chief constituents in traditional Grecian recipes. We like to impart various flavors and textures to our food. For this, we make use of several spices and herbs like oregano, thyme, basil, garlic, bay leaves, persillade, dill and mint. They are used not only to add taste to the food, but also as garnish. We Greeks are a simple people and that reflects in our food. Our recipes are simple and the food can be whipped up in very little time. The taste of the food, however, is delicious and our meals are ideal for those looking to eat a well-balanced diet. Grecian dishes call for the use of lamb and pork to a great extent. We love our meat and lamb has always been a favorite with us because of the fact that the terrain and the climate make the breeding of goat and sheep more feasible, rather than cattle. So don’t be surprised if you don’t find beef in our cuisine. Our dishes are typically accompanied by appetizers we call mezedes (or mezze), which are typically eaten before lunch. Each Grecian region has its own specialty, which means there are plenty of such platters to try and almost no scope to grow tired of feasting on them. Our mezedes are packed with textures and flavors and make for a perfect balance of health, tradition and lusciousness. Some popular dishes in Greek mezze platters include grilled seafood like octopus served with salads, hard-boiled eggs, Kalamata olives and fresh cheese, fried vegetables and garlic bread, fried sausages flavored with orange zest, fried or grilled cheese called saganaki, pork stew called bekri-meze, and meatballs called keftedes and soutzoukakia smyrneika. We love olive oil and use it generously in our daily cooking. In fact, olive oil and fresh herbs are key to producing the flavors that are reminiscent of traditional Greek cooking. Digging into the Grecian mezze is a wonderful way to experience the real tastes of Greece. 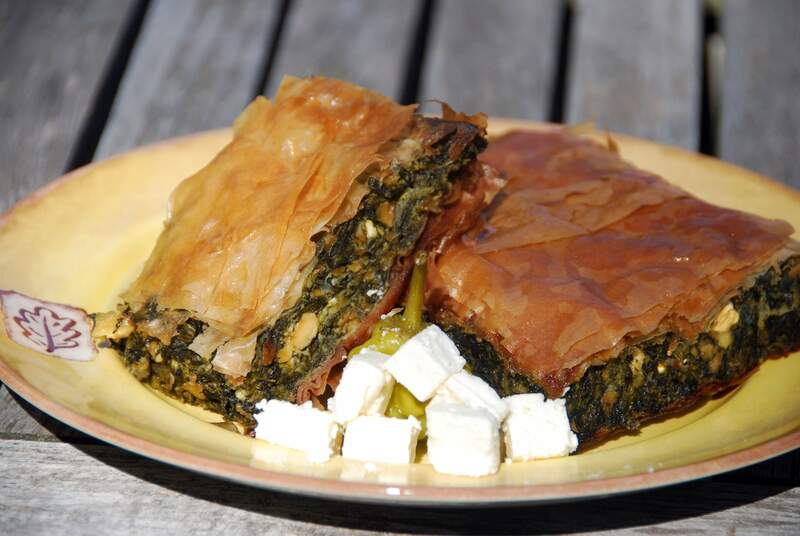 So whether it is our Dolmas (stuffed grape leaves), Tyropitakia, Saganaki, or the famous Spanakopita, they’re all made in olive oil and they taste simply brilliant. We make generous use of nuts and honey in our desserts. Baklava, a Grecian dessert made with flaky filo dough, nuts and honey is known the world over. It is crunchy and decadent and perfect to satiate to satiate your sweet tooth. Other wonderful Greek desserts include galaktoboureko, melomakarona, revani, melopita, koulourakia, and kourabiethes. Arabic food derives its rich flavors and aromas from a mélange of eastern spices and long-standing cooking traditions, which have enabled this cuisine to transcend borders and make its way to a global platform. 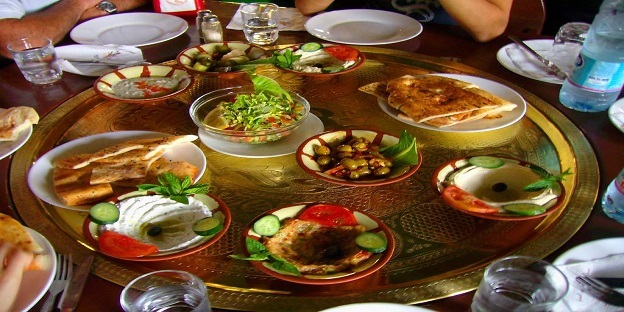 In the Arab world, the food and its taste vary from country to country. However, they all cook using common ingredients such as meat, rice, bread and an assortment of spices. Chickpeas have always been a staple in traditional Arabic cooking and are still used widely to make preparations such as hummus. Fava beans, which are popular in Egypt, are eaten enthusiastically in other Arabic countries as well. 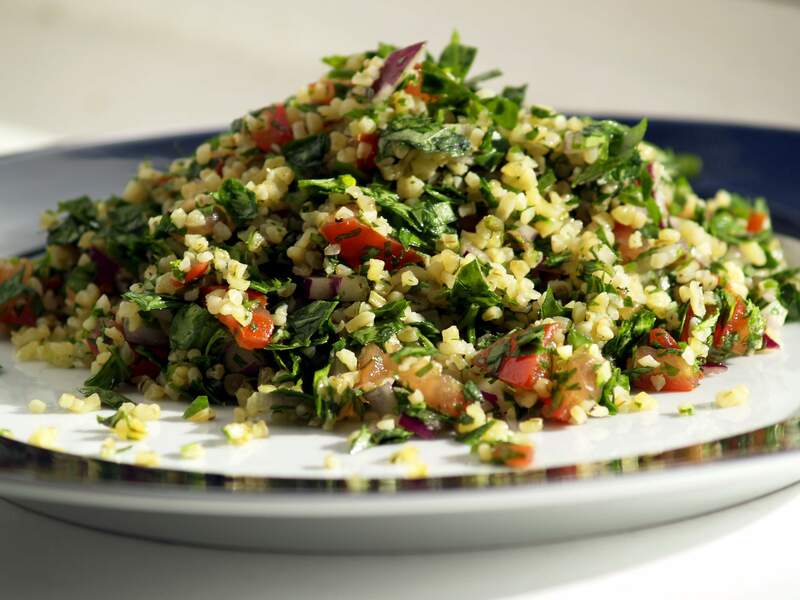 The preparation of Arabic dishes is easy, but they take a significant amount of time to cook. The Arabs believe that the more time they spend cooking a dish, the better it tastes. Their diet typically consists of dates, wheat, barley, rice, meat, and yogurt. Butter and cream are also used extensively. Enticing varieties of dishes made with rice and vegetables, succulent morsels of beef and chicken marinated with the finest spices give Arabic cuisine the authenticity and charm that few can resist. Some of elements influencing these delights include kabssa, bukhari, salona, eish bill ahem or harissa. Arabic cooking employs the use of several gorgeous spices such as cumin, turmeric, cardamom, nutmeg, sumac, caraway, aniseed, cinnamon, allspice and baharat which means mixed spices in Arabic. Their mezze platter consists of white cheese, sliced melons, hot pepper paste and walnuts called acili ezme, thick strained yogurt called haydari, cold eggplant salad, calamir, yogurt with cucumber and garlic called cacik, pilaki, and meatballs called kofte. When it comes to desserts, the baklava is popular here as well. However, it is made using syrup made of sugar and water and is a tad less sweet than its Grecian counterpart. Apart from nuts, Arabic desserts make use of cheese and rosewater to a considerable extent. The favorite desserts here are basbousa, kunafeh, aish el-saraya, qatayef, feteer, halaweh, fakhfakhina, bastani, and mshabak to name a few. Oftentimes, one may find several Greek and Arabic dishes to be quite similar looking and feel that they’re essentially the same items with different names. The lines between these two cuisines may be blurry, but there are certain subtle differences in the way different ingredients are used to lend more definition and authenticity to each. So be a true foodie and enjoy the best of both while you savor and appreciate the influences and methodologies to these two cuisines.